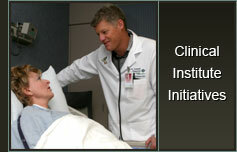 Each Clinical Institute Team requires a physician leader, accountable to the Clinical Institute Advisory Board. 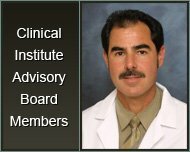 The Advisory Board also appoints at least three Clinical Institute members to each team. These members demonstrate leadership and clinical expertise in the specific clinical area. Amir Ghiassi, M.D. ; James Roum, M.D. Hisham El-Bayar, M.D. ; John Harris, M.D. Brian Boyd, M.D. ; Roger Chang, M.D. Susan Ban, M.D. ; Lawrence Ehrlich, D.O. Marc (Tony) Zepeda, M.D. ; Lilly Ramirez-Boyd, M.D. K. Himisiri De Silva, M.D. ; Vinayak Shanbhag, M.D.